Today is the first day of a new year. It is always one of the most amazing days of the year to me. It is like a beautifully wrapped present. We have no idea what is inside, but it shouts out "possibilities"!!! A new beginning. Another chance to..... (you fill in the blanks). We are filled with anticipation. Awesome. Yet scary. What will "unwrapping" it bring? We do not know. We can hope, we can plan, we can anticipate, we can dream or we can wish. 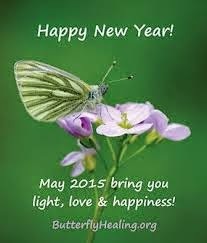 My wish for you is that 2015 will be an amazing year for you and your loved ones. My wish is that you will every day experience the blessings of the Lord, and that your days will be filled with joy and peace, love and laughter and health. I would like to share a few thoughts or ideas with you throughout this year to help you live this year to the fullest, to make this a year of remarkable living. Join me here for an astounding journey through 2015. Keeping a Journal of Gratitude. Oprah made this idea famous, not me, but I would like to dust it off for this year and truly apply it. Every day, before you switch your bed lamp off, take 10 minutes to write down 5 things you are grateful for that happened that day. Sounds easy, but here is the true challenge: you have to every day find 5 totally NEW things that you are grateful for, now THAT's going to get you thinking and really looking around you!!! I mean most of us are on a daily basis thankful for our families, our friends, health, etc, but if we have mentioned that on the first day it stays true for all the other days, so what is next on your list? Makes you think, doesn't it? Happy New Year, my dear readers, and enjoy your journey of Gratitude! You are welcome to share your thoughts or gratitudes with me here, right on the blog. Oh, indeed wonderful things to be grateful for!!! And I am so grateful that you shared these with us and for commenting on my post. Blessings for 2015!! !